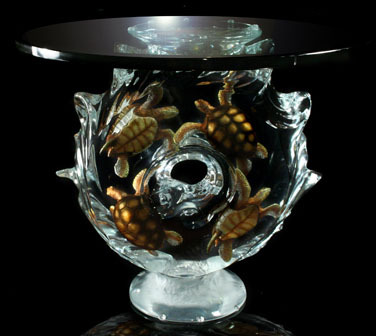 This Limited Edition Sea Turtle End Table is created by award-winning artistic genius Dan Medinas. This Fine Art "Ancient Journey" End Table is created with an eye towards Interior Design, this unique table is crafted from the finest materials. Utilizing lucite and a unique “mixed media” metal these pieces of art are individually hand crafted in the United States. Lucite is the material used in large aquarium tanks. Optically pure, it provides unmatched clarity and brilliance. Each work of art is created using a lengthy process, by artisans skilled in the use of these unique materials. Sea Turtles "float" effortlessly in a poetic tribute to majestic motion.